Paul Williamson, aka 'The Beer Boss' at Hillside Brewery was quick to see working with students opens their eyes to the running of a local business, educates a new generation about what makes a quality product and also collaborating can lead to a ton of fresh, workable ideas. The brewery is a family-run business, established in 2014, that is absolutely passionate about what it does. It is positioned in a beautiful 40 acre spot in the Forest of Dean with a barn area that allows for beer talks, tastings and plenty of events from yoga and zorbing to corporate meetings and rustic weddings. One of the most recent visits was from 25 Level five (Year two) marketing students at the University of Gloucestershire. We caught up with Paul as well as Katie Jones, BA Digital Marketing student at the University of Gloucestershire who was on that brewery visit and explained how that recent meeting has led to an exciting marketing project. Paul and his team have donated their time, expertise and beer samples to students at the university on a number of occasions. A few months ago he visited the university to give an overview of the brewery business and the beer industry. "It's invaluable for our students to meet business owners early on into their course so that their theory can be put into real context," says Matt Barr, Lecturer in Marketing. 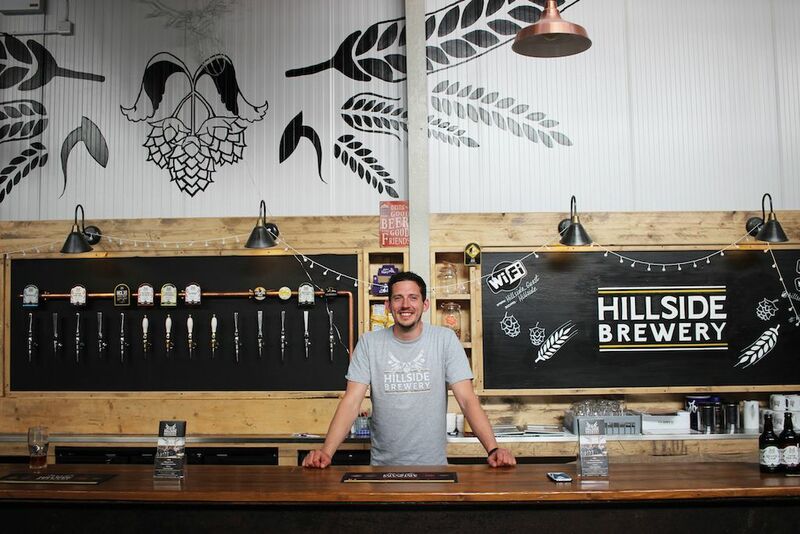 “Paul outlined the problems and opportunities for Hillside relating to location, competition, event and outdoor space and the brewery's macro-environment. "He also discussed why he loves brewing and craft beer. Following the presentation by Paul we arranged a student tour with Sam Copland, the Module Tutor. The tour and talks were given by Paul's colleagues John Widner and Jo York, both experts in their fields of brewing and marketing." The reason behind the visit was to bring the students into the environment of the business that it would be doing their project on which was to create a digital campaign for Hillside Brewery. Paul from Hillside said: "We are both retailer onsite at the brewery but also supplier to one supermarket chain which is the Mid-Counties Co-op group, we are in 120 of their stores and we work with them because they totally get the ethos and importance of community that Hillside embraces. They also work well with us because they understand our products and how we work - we don't discount for anyone for example and they respect that. We've also worked with them to create a special beer just for their customers. "With regards to working with the community we've really enjoyed meeting local students; as well as the University of Gloucestershire we've met with Hartbury College and also Hereford College where we met the business studies students. Meeting with a local business and its brand allows the students to get a deeper understanding of how a company operates and we are totally accessible. We've also met with biology students who looked at yeast development and advertising students who used the brand to work on their own portfolios. "As a retailer, business is getting harder now because there are more breweries in the UK per head than anywhere else in the world. So we need to appraise the business model constantly; we offer great beer of course but we have to see what else we can do such as best use of the space we have. We are positioned in a beautiful location but it can be a double-edged sword as it's not easily accessible by foot so we're always looking at ways to work with that. Sales at Hillside are on the increase and we've had a good year yet we're always looking at the next challenge, which will be the same for all small breweries, however as we don't ever discount our prices, we do try to add value for the people we work with in many ways – such as events, beer pairing support, beer tasting sessions and staff training. "To date we've done very well with promotion through word of mouth and because of our event space we're also delighted to get five star reviews on platforms such as Trip Advisor and Facebook. We are becoming more active on our website with blogs and the introduction of recipes as we've had feedback from customers that they enjoy this and it leads to important, continued interaction with them. "With the students' e-marketing campaign we welcome whacky ideas, we are experimental and think that our creativity sets us apart. We work with companies to create them bespoke beers whether its working with an existing beer and repackaging or creating a new beer that suits the company's taste and personality, for example we recently worked with Spice Works, a professional network for the information technology industry, that wanted to create 1,500 bottles of jalapeño pale ale. "At the moment we have seven beers and a lager available - we have the classic collection that we offer all year round along with the exclusive beers (created for the Co-op group for example) and we rotate the Hillside craft beers - such as the current Belgian triple at 9% - every couple of months. 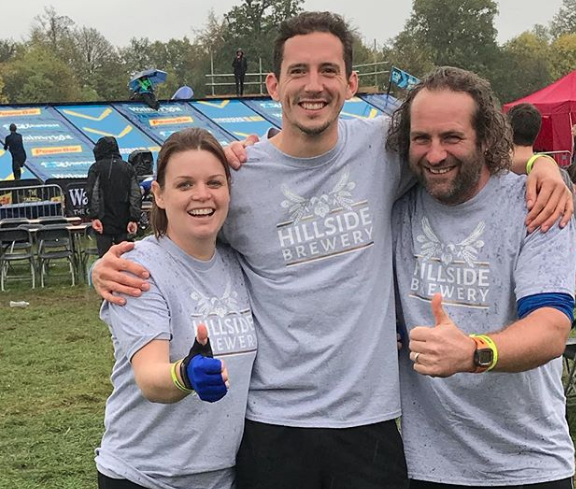 Katie Jones, who was on the trip to Hillside said of the experience: "It's great that we get the opportunity to work with local companies, particularly somewhere like Hillside that has local ethos. It was super of them to accommodate us and whilst in lectures we're taught all the information we need, it's theoretical so to be able to put it into practice is invaluable, it's great to have that element of physicality. "We visited the brewery to gain inside knowledge of how the business works but also to look at the branding in-situ so that we could look at how this could be developed. I like the branding of Hillside, it's visually very effective. The design portrays its utopian world: beautiful scenery, local produce, green ethics. Quite Perfect in every way. "All the staff we met were passionate and this comes across in the products. We were given different types of hops to smell and it was really interesting to see the journey from hop to beer. There were fun experiments too - John from Hillside gave us a haribo sweet and said we had to hold our noses when eating it - there wasn't much flavour but as soon as we let go of our noses and could smell again, the taste of the sweet was completely different so this demonstrated how the sense of smell with beer is really important. These different elements really helped us get an understanding of the complexity of the beer and in turn helps us to shape the e-marketing process for Hillside. "My campaign will be based on the integrity and friendliness of the brand and I'll focus on the community feel of it rather than a blatant 'buy this, buy that' push. One of the creatives I've put together for Hillside looks at rewriting their website. Having listened to John and Jo onsite it was easy to listen to their language and how they feel about the brand - it was always a team effort, they seem to genuinely enjoy working together and everything they did was with a 'we', so I'll ensure this comes across in the copy. "Another area I'll be looking at is the location - although it's beautiful, it is somewhat secluded which is not easy when they are selling beer, which people like to taste, so I'll be looking at how to use the space for other occasions too, Jo at Hillside was talking about the number of events they run including Yoga sessions and hosting a classic car show. "The great thing about the second year of the course is that we have a lot of creative freedom, the first year gives us the basics and there are rules to follow but this year we can see what we feel would work on a campaign. We, the students, can all focus on our own strengths which for example if someone is brilliant at understanding google analytics they'll put something together for Hillside that incorporates that or if a student is particularly creative they can use that to their advantage. Again the Hillside trip helped because John was able to give us the profile of their existing customer, look at the target audience and also discuss what their competitors are up to. "I've come up with a social media campaign that works with a local business that has similar values and qualities to Hillside so we're able to appeal to a certain profile (my view is a 45 year old family man who appreciates quality, craft beer). There will be a social media competition and this allows the brewery to tap into the followers of the other business and also allows their followers to discover and enjoy the brewery. The campaign will be marked on the quality of the idea and how it relates to the product, client brief, campaign goals and target audience. “The final campaign presentation will be put onto Mahara” says Katie, “this is the university website e-portfolio system with photos and videos and it will be marked by the tutors and then, Paul and the team at Hillside can see what we've put together for them." "My campaign will be based on the integrity and friendliness of the brand and I'll focus on the community feel of it rather than a blatant 'buy this, buy that' push"